Little while back Dough Roller had an article When Does Frugality Turn Into Cheapness? and they gave an example of bending down to pick up a penny. 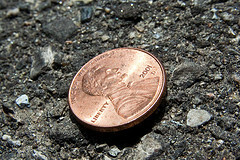 That got me thinking about picking up lost pennies. Lately though I've been finding myself too lazy to pick up a mere penny. I fully admit that sometimes I'm lazy as lazy can be. Anymore a single penny will buy you nothing. All my pennies just get thrown into a jar which sits on the counter. So it is easy to think that picking up a single penny to throw into my jar would not get me anywhere. I just can't be bothered to take 1 second to bend down. Is it worth the time? I assume many people quickly answer with a positive. But to me sometimes it just doesn't seem like its worth it. Hows the math work? Is the Time worth the 1¢? It takes 1 second to bend down and pick up a penny. There are 60 seconds in a minute. There are 60 minutes in an hour. There are 3,600 seconds in an hour. Making 1¢ in one second is equivalent to making 3,600¢ per hour. Thats an hourly wage of $36.00 tax free. Bottom Line: Yes you should bend down to pick up a penny. Its equivalent to $36/hr.